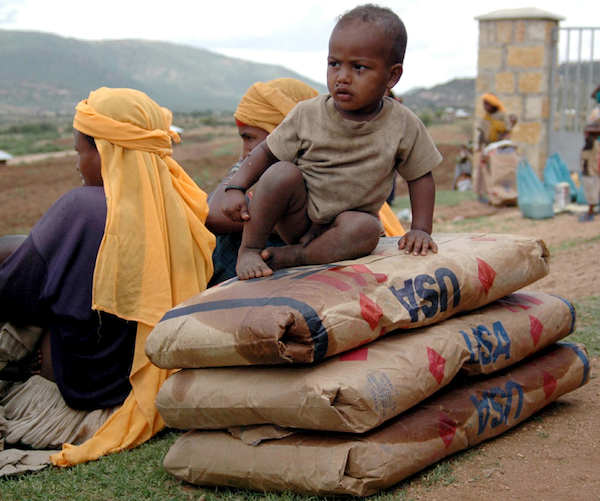 Foreign aid is critical to ending poverty. President Trump is widely reported to be announcing his desire for wide-ranging cuts to US foreign aid today, to help pay for a $54 billion increase to defence spending. At just 1% of the US budget, America’s foreign aid is a vital part of our national security, of America’s influence in the world, as well as saving millions of lives. Global Citizen vehemently opposes any foreign aid cuts, and calls on Congress and President Trump’s Cabinet to ensure that these cuts do not take place as the full budget is created in the coming weeks. Cutting foreign aid is a deeply misguided move that endangers the security, health and future prosperity of America, and the stability of the world. Foreign aid plays a vital role in supporting the stability and peace in some of the world’s most fragile countries, including those from which America has faced significant threats of terrorism. Democracy and governance assistance helped transition 36 nations to democratic government between 1980 and 1995, building more stable allies and partners. Foreign aid protects the health of Americans and the world. Polio was eradicated in the United States in 1979. In 1988, during the Reagan Administration, the United States helped to launch the Global Polio Eradication Initiative with Centers for Disease Control and Prevention (CDC) and USAID as two of the four founding partners. Over 350,000 people contracted polio in 1988, but thanks to the success of the Global Polio Eradication Initiative, there were only 37 cases of polio globally in 2016. Conservative leaders in the 1980s knew that it wasn't enough to just contain polio. A globalized world with high rates of international travel means that diseases can spread even faster than before. Leadership from the United States helped make polio eradication a global priority and donor countries like Canada, the United Kingdom, and Japan followed suit. Foreign aid creates new markets for American exports, and helps foster the peace and stability in other nations that is vital to ongoing American prosperity. It was American aid that rebuilt Germany and Japan after World War Two, and South Korea after the Korean War. These countries are now our fourth, sixth and seventh largest trading partners, to which more than $150b of exports are sent every year. Moreover, 43 of the top 50 nations that buy and consume American agricultural products were once U.S. foreign aid recipients. It is for all these reasons, in addition to the moral belief that all lives, everywhere have value, that foreign aid has had strong bipartisan support. In fact, its support has often been strongest from Republican leaders — it was President Bush who created the President’s Emergency Plan for AIDS Relief (PEPFAR), which has provided life-saving antiretroviral treatment (ART) for 9.5 million men, women, and children. And, if the US were to eliminate its funding to the Global Fund to Fight HIV/AIDS, TB and Malaria, it would lead to the deaths of almost 900,000 people who would otherwise have lived in its first year, and more than 2.5 million deaths over three years. And in Congress, the leadership of strong conservatives continues to be at the heart of the US foreign aid program. Senator Lindsey Graham from South Carolina, Senator Thad Cochran from Mississippi, Congressman Hal Rogers from Kentucky, Congressman Charlie Dent from Pennsylvania, and Congresswoman Kay Granger from Texas - among many others - have fought long and hard to defend global development, even when this fight came with high personal costs. Each of these champions have heeded the call of Global Citizens, operating under the understanding that spending on development fits squarely with American interests. For decades, American leadership in the world has been taken as a given. With these cuts, and President Trump’s outrageous refugee and muslim ban, the country is walking away from the goodwill and influence that has underpinned its security. The President has long claimed that he will make America safe again. These proposed cuts to foreign aid will have the opposite effect. Global Citizens across America reject them, as we expect Americans and Congress will too.